Fusing audience research and ethnography,the bookpresents a compelling account of women’s changing lives and identities in relation to the impact of the most popular media culture in everyday life: television. Within the historically-specific social conditions of Korean modernity, Youna Kim analyzes how Korean women of varying age and class group cope with the new environment of changing economical structure and social relations. The book argues that television is an important resource for women, stimulating them to research their own lives and identities. Youna Kim reveals Korean women as creative, energetic and critical audiences in their responses to evolving modernity and the impact of the West. Based on original empirical research, the book explores the hopes, aspirations, frustrations and dilemmas of Korean women as they try to cope with life beyond traditional grounds. Going beyond the traditional Anglo-American view of media and culture, this text will appeal to students and scholars of both Korean area studies and media and communications studies. 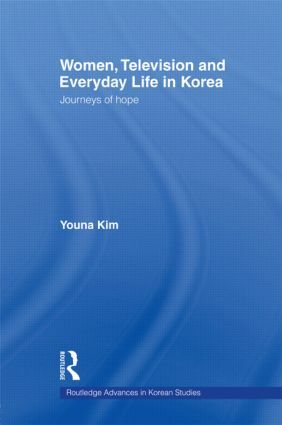 Youna Kim is Lecturer in Media and Communications at the London School of Economics and Political Science.